This page will show how to use the subwoofer from the Altec Lansing ACS295 2.1 speaker kit as a stand alone active subwoofer without using the satellite speakers. The speakers are controlled from one of the satellites (as seen in the picture below, the controls are on the left satellite speaker) so if the satellites are lost the subwoofer is dead in the water..
After studying the datasheet for TDA7433 and this page about I2C I wrote a controller program for a Atmel Mega8 using avr-libc and connected it to SDA and SCL together with 4.7kOhm pull-ups (there are no pull-ups on the circuit board inside the ACS295). Power the amplifier on by connecting the power pin to ground as shown in the pinout above, send the right parameters via I2c and eureka, we have a working subwoofer! :D Unfortunately Altec chose a cheap plastic to cover the back of the subwoofer and this plastic vibrates and makes a noise when the base is pumping :( Let me know if you find a solution to this (we are thinking of replacing it with wood). I´d be happy of you post a comment if any of this is useful to you, happy hacking! Hello Sire I'm trying to hack my sub, and I've read your explanation, but I really don't know how to exactly? Would you please help me out Sir. Do you mean I have to "load a program onto an atmel chip, and then connect the atmel chip to SCL and SCA ? If so where can I buy this chip, and how do I load the program on to the chip? (I really have no idea how to do this)??? Would you please help me out, thank you so much, you can email me at bvden@yahoo.com if you wish to. THANK YOU IN ADVANCE SIR, KEEP UP THE GREAT WORK !!! Atmel AVR:s can be bought from most larger electronic stores, for example farnell.com. The simplest way to program them is via the parallel or serial port of your computer, for example like this. The simplest way to program a Atmel AVR is via the parallel or serial port of your computer, for example like this. Serial Data (SDA) and Serial Clock (SCL) are the lines used in I2C communication. The subwoofers functions are controlled via serial data commands sent to it via I2C. I'm go to web http://code.google.com/p/acs295/ and didn't see any thing about wiring and Atmel AVR's code. Can you checking the web or sen me a diagram and coding of this project. I don't have wiring diagram, just connect SDA and SCL of the AVR to SDA and SCL of the subwoofer. And connect pullup resistors to both SDA and SCL. And connect +5V and ground between the sub and the AVR. The connect ground to the power control input of the sub to turn it on. can you tell me exatly how to use the subwoofer alone...any picture showing the connection step by step...thnks a lot. love: What in my description are you having trouble with? Pretty much everything is explained in my post together with the comments..
How to connect the port if i only want to operate the sub volume botton, or can add another addition volume control ? If you connect everything according to the post (and comments) you will be able to use the sub volume knob to adjust the volume..
showing the connection step by step...thnks a lot. The connections are described step by step in the original post plus the comments. 4.7kOhm pull-ups (there are no pull-ups on the circuit board inside the ACS295). - what is this? maybe its understable for electrician, not for others. In the text on this page.. I linked to information about I2C (pull-ups, SCA, etc) and AVR:s in my comment made on August 5, 2007 9:31 AM (comment number 4 from the top). I described the physical connections in my comment made on August 13, 2007 6:18 AM (comment number 6 from the top). Read all the text (inluding all comments) on this page (read it again if you already have) and if you still have any questions after that please post them here and I'll try to help you! Lars, Thank you for all the usefull information. Do you know if the TDA7433D comes with a default program installed from the factory or does a brand new one have to be programed? I couldn't tell by looking at the data sheet. I have to replace a bad one in the acs295 speaker system. The TDA7433D doesn't have any persistent memory in it as far as i know. It has to be configured via I2C every time you power it up. This is normally done by the sattelite speaker that holds the volume control etc. In my solution it's the AVR that sends these I2C commands instead. So it shouldn't be a problem to just replace the bad TDA7433D with a new one. Lars, thanks for posting this! Using the links you gave I'm sure I can make this work. I have two questions, though. First, how did you mount your Mega8 chip? I guess I am going to buy a box and mount and splice the existing cable to that, but could you give me some guidance? Second, which Mega8 chip did you use? Will the ATMEGA88V-10PI fit the bill? I soldered the mega8 onto a experiment board and then simply attached some wires which I put into the connector on the sub (I didn't have the original cable or a replacement male connector). I used the plain old mega8 (ATmega8L-8PI) but the newer mega88 should work just fine. Good luck, let me know how it works out! is there no hardware-only solution, like solder the input wire to the top of the potmeter? Not that I know of. The IC that controls the volume and such must be activated via I2C. what about driving signal directly into the power amp (TDA7370)? Bypassing the TDA7433D is the approach I used to get the sub working. I disconnect the two output pins of the TDA7433D (unsolder the pins and bend them upwards) and soldered jumper wires from the TDA7433D inputs to it's outputs. This completely takes the control chip out of the audio path. You will have to add a seperate volume potmeter ore use the volume control of the PC/ iPod. Well... i gave the hardware hack a go and I got nothing from the sub. on the audio prssesor chip tda7433D I connected lifted pins 13 and 14(outputs) off the board. Then I connected two wires to the holes in the board that are connected to pins 5 and 6 (inputs. I then soldered them to the two output leads that I lifted off the board. I connected the sub straight to the comput and got nothing. Then I connected the sub from the output on the satelite speaker and got nothing as well. ??????? ANY IDEAS??? before I throw this thing in the garbage!! I can't help you much with the pure hardware hack since I've only tried the software+avr solution. Are you sure the TDA7370 is getting power and signal? I looked for the source at the google page but it wasn't there. Where can I obtain the code for the AVR chip? Do you know if the connector on the back of the speaker is any sort of DIN connector or some other connector that can be purchased? Yeah, it's probably a standard connector but I don't know what it's called. Look through the connectors on farnell or some other electronics shop and I bet you'll find it. Good luck! I've got the chip programmed but have a question. If I hook the chip up to +5 volts and the ground on the subwoofer and then hook up *5 volts on the subwoofer to ground this then amounts to running the voltage in to the chip to the ground on the chip. I don't understand what you are asking, can you try and say it in another way? Where did you get the idea to do this: "and then hook up *5 volts on the subwoofer to ground" ? That's correct, ground it to power on the subwoofer. Very sorry for OT but I'm in trouble with my ACS295 - red connector is broken.Does anybody know the type of connector? Then either hardwire the POWER pin of the picture in original post to ground or put a switch to do so. I chose to run some wire from inside to a switch outside the case. But. This is a 4 ohm sub right? I have a 5.1 receiver and all my other speakers is 8ohm. Does it matter? Can I connect the this rebuilt sub now then? Or shall I replace the base-element to a 8oh one, I got one so I can do that if it matters and make any difference for the sound approvement? And if so, can I just simply replace the base-element and nothing else within in inside? Underbart jobb! I don't know if it's 4 or 8 ohm, or if you can mix the two.. a quick google search gives lots of answers though. It doesn't matter if it's 4 or 8 ohms. The power amplifier inside is already matched and the input impedance of the sub could be considered infinite. Just don't plug a speaker output of another system to the input of the sub. Unless you want to completely bypass the electronics inside? excellent post mate. you got me hooked on circuitry even though i do not know anything. is there a way for the whole sytem to work as it used. what i mean is can one still hook up speakers and still recieve sound from the satellites speakers? Sure, you can hook up the left and right speakers. 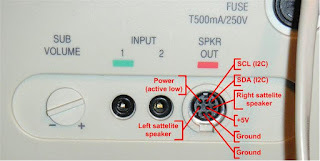 The pinout of the connector on the sub shows "Left sattelite speaker" and "Right sattelite speaker", just use those and ground. I learned it in university and on the internet. I don't really have any textbooks I use, almost everything is available through google! Just google what you want to learn more about. As for the pinout I simply googled the model of the IC in the sub (TDA7433) and found its datasheet where the pinouts are described. After that is was simply a matter of following the copper tracks on the circuitboard to see which pins lead to which connector. thanks again. the reason i ask is because i found an altec lansing acs54 which has four satellites and a subwoofer. it seems to have the same pinout as yours but will look at the datasheet. while yours only has one ic mine has two :0. its a tda 7372b and a tda 7350a. hopefully i will get this thing to work. well thanks for all your hard work and responding to my posts. I'm trying to do the hardware hack on a model acs295. It has a tda7433d chip as well as a tda7370B chip. Neither chip pins are numbered. How can you determine the pins 13,14,5,6 correctly? The pin numbering is shown in the datasheet for the IC. Funny, I only have the satellites, no sub; thanks for the pinout though. Hej! Här kan du läsa den översatt. Om det är något som blivit dåligt översatt så är det bara att fråga! FYI some versions of this sub have a different chip inside. I have one with a TDA8424. For the hardware hack, the process is the same, but you must lift pins 13 and 9, and solder wires from pin 1 to 13, and 3 to 9. Search for the datasheet online to get the pinout. You still need to bridge the GND and Power (Active low) pins on the multi-pin connector to power the amp. And if you find that your speaker cable is damaged, you can replace it. It's a standard 8-pin mini-DIN cable. You could either buy a new connector and make up your own cable (eg using a length of CAT5) or buy/repurpose an old cable+mini-DIN connector from something else. Lots of devices use this kind of connector. The one I found on eBay just now is an old Apple printer serial cable. Check the mini-din page on Wikipedia for a list of other examples. And one last comment: the original sattelite speaker has an Atmel chip in it. Written on the chip is "ATMEL 745 24C01A-PC. There is also what looks like a custom 18-pin DIP IC in a socket, with a white label that says "29518D". Thanks for all your input Steve! Very useful site. Just one question: how does one get inside the controlling (right) satellite speaker to get at the electronics? Since I don't have the satellite (hence the hack :)) I can't help you with that unfortunately.. I everyone. i recently found one of these subwoofer in an old store room at my university. It had the transformer removed so i replace it with one that is compatible (i think)but it had no satelite speakers just the sub without transformer. when i added the trans and plugged it in i heard a slight sound then nothing. i'm considering just yanking out the amplifier circuit and just buying another and using it as just a spkr box cause that software thing wudn't work 4 me. the comment about the subwoofer found at my university was me. just didnt get how to put a name. I'm considering trying the hardware approach caus i like that thing abt the computer controlling the sub's volume. Ok, good luck with the hardware hack kamzz! hello mr Englung, Kamzz here again. so i have the Altec lansing 295 and recently got the 340 with the satelite speakers and everthing works ok except i'm trying to use the satelite speakers on the 295 since its more powerful than the 340 but the main control cable has nine pins while the 295 only has space for 8 pins so wat is the ninth pin for and how can i go around it? Kamzz, I've never seen the 340 so I have no idea what the extra pin is for. I suspect you would have to take it apart to see what the different pins lead to..
Mr. Englund i need a schematic for the 6 pins at the power input on the actual amplifier circuit. Not sure about what goes where since i'm basically experimenting with it. I'm not sure which port you mean. The 6 pin port of the ACS295 is described in my original post above (with a pinout image). Wow, this page is awesome! I just found a discarded acs295 without satellites. Thanks a bunch! Do you have any pictures after completion? Sorry, I didn't take any picture of it and I gave the subwoofer away to a friend. Hey Mr. Englung, i solved the problem i had with the acs 295. all i had to do was to connect the power to ground using a straightened paper clip and the sub was powered on, then i just fed it the input and that was it. Some hing was wrong with the input jack because it just did not respond when i fed the input to i so i had to feed the input directly to the audio contrller IC inside and that wasit. Thanks for assistance cuz now i have both the acs 295 and 340 blasting in separate corners of my room. Jag har precis köpt en likadan baslåda på Amnesty för 60kr (utan sateliter) och tyckte det var ett riktigt fynd tills jag upptäckte att den behöver styras. Finns det möjlighet att du kan programmera mitt chip? jag kan komma med bara kortet. Är bosatt i Halmstad men tänkte besöka Göteborg under semestern. Jag skulle rekommendera hårdvarufixen som beskrivs i kommentarerna ovan (först av Leon och sen mer detaljerat av Jerther). Den är enkel att göra och kräver ingen programmering! I did the hardware mod today and it works perfect! I can also use the sub volume control on the back. I would recommend the hardware fix that is described in the comments above (first by Leon and later more detailed by Jerther). It's easy to do and requires no programming! i don't understand what you did to let it word have you some pics and maby a surcitdrawing? Hi Ruurd, please read all the comments and you will find a easy-to-make hardware hack that requires no mcu. Greatly appreciated in your post although I did not use your method it helped me fix it in 15 minutes with the bypass. Taking many electronics courses both USA and GER, I'm always trying to repurpose devices. This is a great one. In addition to your hack, I decided to make a great music box for my nephew. I added the Left/Right speakers internally to the box and hot glued a box around them to isolate them from the base. drilled lots of sound ports (holes). added a 5vdc micro/mini USB output dongle and phono input dongle. got a piece of foggy plastic (former cutting board) and topped the project with seperating pegs for looks. Board covers all holes for a nice look and the seperating pins raise the board enough to allow the dongles out and the sound out. Now he can connect his phone and listen like a quality stereo all with portability. Later I added a cheap Bluetooth option. just power the BT with the 5vdc and connect output to a switch. now he can power on and connect BT, or power on, flip switch and use any phono input. after the BT addition I wanted to keep it for myself :) But he is family, so I'll look for another one or better for mine. He has asked for me to replace the screen, add carrying handles and paint it black. SLEdie, awesome to read about your hack, you really took it to another level! :D You should make a blog-post about the build! Hey, just a big heads up: one of the commenters noted that some of these modules have a different chip. I was pulling my hair out for about half an hour because the speaker wasn't responding with any ACKs, and I finally changed the address to 0x82 (for the TDA8424) and got a response! So for anyone who's stuck on the software method, try checking out the TDA8424 datasheet and sending the values for that chip. Cheers! thinking - jump from out to pot - to in .??? Thanks for all this info, I just found one of these subs in a second hand store for only 40SEK so I just couldn't refuse buying it, even though I knew it'd probebly take some work to get it running without the sattelites, but works like a charm now using that easy hardware mod, so thanks for the info! Nick here. I see these powered subs minus sattelites turning up cheap at thrifts with more frequency. It is surprising that there isn't a better developed knowledge base for their re-purposing. I have a "Harman Kardon HK395" which when googled for images turns up the mini din pinout workaround. That works lickity split. I am also looking to do the same with my Altec Lansing ACS56. I've had it apart and believe that according to the existing "hardware method" I would need to pop pins 4 & 5 (TDA7449) up from the PCB and then solder pin 7 to the hole from 4 and pin 8 to the hole from 5. How do I determine which pin on the 8 Pin Mini Din is POWER. The ground seems obvious. Is it a given that I should hotwire the POWER to GROUND after having lifted pins and re-soldered? If you value your time.. Even the most basic home theater sub will play lower and louder than this. Look on craigslist for a used home theater sub for $20 & you'll get far better performance. Superb post! Exactly what I needed. Props also to Leon and Jerther, for their supplemental posts that provided additional options. I know this is ancient, but I've just hacked a sub I found. Thanks for this info Lars. I considered using your method, but I didn't want to waste using one of my arduinos. I used a hardware hack, and it's far easier than others have explained here. R75 is left channel,R49 is right channel. The side of the resistors that is closest to tda7433 is the satellite input, and the other is the sub. So, I just ran 2 wires I soldered to the input jack pins. Tip pin to r75, ring pin to r49. I soldered the wire so that it lays on top of and bypasses the resistor, since I wanted all outputs to work as they should. Of course I jumped out the power control pin as well. Now I can plug whatever speakers I want it, and it sounds amazing. I hooked up 4 bookshelf speakers plugged my phone in and cranked it to 11, no distortion, just loud clear, full of bass goodness. Oh, and if you're here looking for a hack for a slightly different sub controlled by a 7833, the resistors you're looking for are attached to pins 13 and 14. Dustin, I've replied to your Google hangouts request. I'll be glad to help any way I can. Well I gave it my best after reading, and re-reading, and re-reading....I have the TDA8424 in my 295. Ultimately I think I over thought the steps and did it backwards! Before I tear this apart again, can anyone verify my fault! I soldered a thin wire from 1-13 & 3-9, but I understood it as 1-to the lifted pin #13 and 3- the lifted pin #9. I believe now that I should have soldered to the board, replacing the pins I lifted with my thin jumper wires! Sooooo, do I tear it apart and solder to the board, and not the lifted pin or did I do it correctly? Kinda feel that I pulled a moron move and should have known better...I hope you laugh, cause I know, right along with my frustrations for time lost.....I'm laughing if I didn't d it wrong! Hi, I haven't performed the bypass hack myself but from the description of it I think you should lift the output pins and then solder wire from the input pins to the place on the board where the outputpins used to be connected, thus bypassing the audio processing alltogether. So my guess is tear it apart and solder to the board..
if I could fix the red connector from the ada 70 if I wore the ACS scheme 295 ? Ok I know it's late in all this but I beat you all in this and wasn't even trying. and it worked fine(although low volume it still could be used)without the other speakers. through the sub volume knob(if you call a dial a knob). removed from the back of my sub. I settled on an extra Microsoft PS/2 to USB adapter(http://www.ebay.com/itm/Microsoft-USB-Mouse-Female-to-PS-2-Male-Adapter-Green-/111790821085?hash=item1a07408edd:g:4ZIAAOSwBLlVSplT) I picked up for like a buck. I had no clue what or how this was going to go but I was ready for anything. I turned on my input device(a PSP) lined out from there to the input 1 on the sub. the volume came up real high. I knew at that point there had to be something about adapting a "speaker out" 5 pin custom port to a rigged up one that turns into four. ALL YOU NEED TO DO IS WHAT I DID AND IT'S BOOM TIME. Hej Lars, tack så mycket för din blog jag är en till att har denna speakers. God Jul och Nytt År. I would like to say that I am going to do the hardware hack due to in Christmas everything is closed and I am lazy to program :p (förlåt Lars). I have a doubt regarding this: Bridge the GND and Power (Active low) pins on the multi-pin connector to power the amp. This means that this is in the same chip (TDA7433D) right? and what PIN is the power? according to the data sheet the ground is 20. I broke the pin on my altec ad 888 and it is 8 pin and I would love to have my front left speaker working again could you please help ? Hi Lars. Thank you for this post (even though it was ages ago!) I have been running the sub as a stand-alone unit for a couple of years, and for their size they're fantastic little units. However, if I wanted to run the satellites by sending the initial two-channel analogue audio signal TO the sub (via input 1 or Input 2) and then out to each satellite (presumably via the multiway plug and socket) would that work? and hopefully that way the system volume (satellite and subs) will be governed by the input level. If this can be done, presumably the left and right satellite outputs are taken from the sub via pins marked 'Left Satellite speaker' and 'ground', and then also Right Satellite speaker' and 'ground'. Just for clarification, are the two inputs both stereo inputs (ie two in parallel) or are they both mono inputs, one for each channel? Just labeling them '1' and '2' is not that helpful, and I'm not aware of how the system was originally designed to be connected to its original satellites, hence my vague query. Really awesome post thanks Lars. Could not have been any clearer and detailed. @Rafael 3yrs late but here goes :) The "Power (Active low)" is located in the connector for the satellite speakers (which we did not have). So I just took a small wire and inserted one end into the hole for "Power (Active low)" and the other to one of the two ground holes. I don't know how the satellite connector maps to the TDA7433 pins. @Michael Choate pin 8 on the connector or on some IC inside the speaker? @Warren Blackwell Thanks! Glad it's still helpfull 10 years after being posted!